contact someone here. If you can, answer some or all of the questions so we have a better idea of what, how , why, and when you need geophysical services. Tell us what you are doing. The less we know the harder it is to assist you with your geophysical project. Follow this link if you need help with mapping levee geology. Do you have any required specifications that pertain directly what types of geophysical methods you need to conduct? Do you have experience with geophysics? When does your geophysical investigation need to be completed? 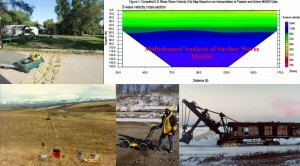 Where is your site that needs to be investigated with geophysics? How big of an area needs to be investigated? Do you have any preference of what type of geophysics you would like to use? Are the geophysical results used for personal or for business needs? Do you have people that can assist with the investigation? Are there safety meetings or other safety issues that can potentially inhibit the investigation process? Are there any hostile parties involved? How many days to you have access to the area of concern? Is access to the site an issue? what is on the ground surface? If you need a geophysical survey done contact GeophysicsSurvey.com. We can provide quick estimates or detailed proposals for your engineering geophysics. Not all of the questions above will apply to your geophysics survey. We understand that one of the most awkward situations is when a client will demand one type of geophysical method because they had great success with it in the past. However, the client may not have a clear understanding as to why the method worked so well, the last time. As an example, ground penetrating radar results are exciting to see when acquired from a good record area, like a mine pit or quarry floor. The same GPR survey would not likely produce exciting results if it was done to locate a metal pipe buried in the clay rich waste pile at the same mine or quarry. Geophysics works, just not at every site. Call2 62-242-4280 or fill out the contact form.